I hope my fellow Canadians are enjoying the day off and my American friends are gearing up for July 4th on Monday. As mentioned in my previous blog post today is an appreciation giveaway!!! It still surprises me that a small group of people are actually interested in me and are true fans cheering me on to accomplish the dreams I have in life. To qualify for this appreciation gift, you must comment here on this blog post or on my facebook photography page with who or what you appreciate right now...today...this moment. I'll do a random draw out of all the entries and the winner to be announced on Monday. What's the giveaway you ask?!? Well...as a little hint of more changes happening this summer, I'm going to giveaway something that I love....lotion! Yep I love it all...the pretty smelling lotions, potions, shower gels and body sprays....especially if it has a berry or vanilla scent to it. 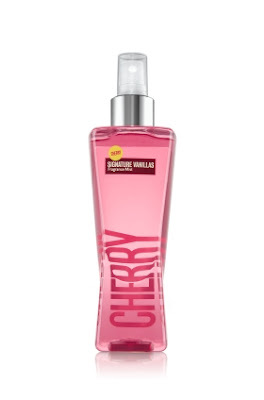 The lucky commenter will receive a Cherry Vanilla Gift Set from Bath & Body Works....yum! So get to commenting my lovelies.....this giveaway is definitely something you'll want to add to your summer scent selection :) And guys feel free to comment too...it would make a great gift for that special lady in your life. In this moment I am appreciate for my boyfriend who has gotten out of bed at 7:30 this morning to get me a coffee and good morning kisses! :) And for my beautiful son... Who is being such a good boy! Ohhhh and this holiday!! I really needed this!! :) HAPPY CANADA DAYY!!! I appreciate that will have this wonderful country, today Canada Day we will be spending the day celebrating Canada's Birthday and spending the day with family & friend's. I have my son, his wife and baby coming home for a holiday, I believe that this is the highlight of my day.I have not seen them since Christmas Holiday's, the next two weeks are going to be very special for me. I appreciate that we have this wonderful country, today Canada Day we will be spending the day celebrating Canada's Birthday and spending the day with family & friend's. I have my son, his wife and baby coming home for a holiday, I believe that this is the highlight of my day. I haven't seen them since Christmas Holiday's, the next two weeks are going to be very special for me. Right now, I appreciate my children, my husband, my family, and my life - the peaceful, not-so-quiet moments. Oh and that was me, Angie, that made the comment above. I appreciate days like today when I get to hang out with my little family & enjoy each other. ...& I appreciate YOU & all of the motivation & inspiration you give me! Today I am most appreciative for my health...everyday we hear of so many people with sooo many different illnesses and deaths and we fail to appreciate the level of health and strength we have each day to do the "basic" things that we take for granted and often complain about. I Thank God that I have a healthy family and friends. Anytime anyone asks me "How are ya?" I often reply with, "I am great..things could be a lot worse" How true, eh???? After hearing of a young mom with three kids including a baby the same age as Charlotte, who has a very aggressive cancer, I am super grateful for every blessing of health and strength that God gives me to get up and go about my daily life with "ease". Cheers to you! I appreciate my husband and my 2 boys and the fact that we are all healthy! I appreciate spending time with them every day. I also appreciate my family and friends and the time we share together.